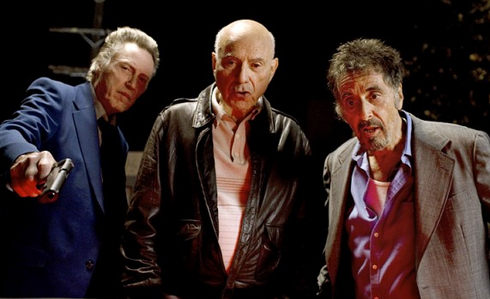 Al Pacino, Christopher Walken and Alan Arkin walk into a hotel room, and that sounds like the set-up for a joke. It's more like a long-delayed punchline. These guys have been stars for more than 40 years, but until "Stand Up Guys," they've all three never been in a movie together. Arkin and Pacino were in "Glengarry Glen Ross" together, and Walken and Pacino were both in "Gigli," but that's as far as it goes. I mention they go way back. "Yes, absolutely," Walken says. "I've known Al for decades, from New York and from, you know..."
"He didn't know I was an actor," Pacino says, "until we did this movie. He'd just see me around the street a lot." "We never worked together, you know, for 30 years or more, something like that," Walken says. "Do you remember that time," Pacino asks, "When we almost got to do a reading for Joe Papp for 'Hamlet'?" And now here they are co-starring in Fisher Stevens' "Stand Up Guys" as old cronies in crime. It's a lovely hard-boiled comedy, opening Feb. 1, where they seem to have spent years working together. Not quite. As the movie opens, Pacino has just walked out after a long prison sentence. He's met outside by his old friend Walken, who has some awkward news for him. He has been hired to kill him. The two men conemplate this news with solemnity. Walken could always shoot him right then and there, but instead they go on a long day's journey through that night and onward, reviewing, in a way, their lost lives. They do this in a real city that looks curiously like an abandoned movie set. "One thing I noticed," I said, "is that there are very few extras in the film. I remember seeing only one or two people on screen, apart from people who had dialogue. A few gangsters. Nobody in the restaurant." Pacino: "I think part of the vision of the movie was to give it a kind of anonymity. That was a choice of the director." Walken: "Yeah, I remember the director talking about not wanting it to be identifiable as to any particular place." Me: "The city streets are essentially empty, except for the three of you." Pacino: "As it should be!" Me: "I suppose it helped Fisher Stevens that he had a lot of acting experience. Many directors might be intimidated by three actors of your stature." Pacino uses that as an opening to mention the new film he has directed, "Wilde Salome," in which he plays King Herod and Jessica Chastain is Salome. "She's marvelous as Salome; she's actually great in the part." "She's a brilliant actress," Arkin observes. "She's in everything now." Pacino: "I never saw in my career, in my entire time doing this, I never saw anyone in the business who's not a household name yet, but so sought after as her." Me: "Christopher, the way you exclaim, 'OH!' has become a trademark. You use it once in this movie, and it's appropriate and perfectly timed." Arkin: "Ever heard that before?" Walken: "I think many people have said that." Arkin: "I mean, your saying 'OH!' I mean has anybody ever mentioned that before?" Walken: "They say I say, "'WOW!' "
Me: "You've gone viral on YouTube with your readings of children's tales like 'The Three Little Pigs.' "
Walken: "Yeah, that's true. Those things, I did them and I didn't even know what I was doing. I was on some TV show and they said, would you read this, and I said yes. That's maybe not such a great idea. But you're right. I have done a couple of those but I never knew what it was when I did it." Pacino: "The way it should be." Walken reveals he's a fan of viral videos. "Some things, you know, they're crazy. I love the videos about Henri Le Chat Noir, the French cat, he speaks French. Have you seen it? No, you must. It's hilarious. YouTube is full of stuff. Crazy things, water-skiing squirrels. People doing the macarena all by themselves, you know." There is a crucial scene in "Stand Up Guys" when some oxygen is removed. I ask Arkin, "Uh, in the movie, to take away the oxygen--is that a deliberate decision to die?" "No, I think he just wants to have a good time. I think he wants to get the hell out of there and have a good time. I don't think death is on his mind at the moment. I don't think it's in his mind until after he dies, actually. Then he starts thinking about it." I ask Pacino, "Al, your character brings such a back-story to the movie. Is he inspired by earlier characters you're played who may be near the end of the road?" "Oh! Who could that be, I wonder? Actually, could be, now that you mention it. I can't think of anybody--well, I don't remember--I don't know, I can't remember a character. You guys know my work." Pacino plays a character named Lefty in that film, who's over the hill. Arkin: "He didn't have the bravado, this guy." Pacino: "No, as Mike Newell, the director, told me, my character was more a kind of a 'Death of a Salesman' gangster." I grow thoughtful: "Does it seem to you that our lives are getting to be about closure?" "Well, they always are, whether you like it or not," Arkin says. "I think people would like to put it out of their minds. It's not out of my mind anymore. These days I look at a script and say, 'What page are they gonna knock me off on?' I say, 'Oh! I live until page 83! That's a good script.' "
"Thinking back to YouTube," Pacino said, "Have you seen Key and Peele? Oh, man, they're comics! African-American comics. They have this thing where the both of them, they're in a bar, and one sees a girl he likes at the end of the bar. He says, 'Gee, you know, I'd like her.' It's obvious he's married or something but he'd like her, you know. He says, 'Gee, I wonder if I can get her number,' and he goes to the bar and of course, his friend is there already, and has the number of the girl. He sees another girl and he goes to that part of the bar and he hits on her and of course his friend is talking to her. Anyway, he gets home and he's looking through a magazine and he sees this beautiful girl in the magazine and his friend is in the picture with her. He grabs his wife and looks in the mirror and he sees his friend as himself and it just won't stop." Pacino begins laughing so uncontrollably tears run from his eyes. Walken and Arkin regard him. "Like 'The Twilight Zone,'" Arkin says. Me: "I'm sitting here with three legends. It occurs to me that it's a little one-act play." "You come out to about 150 years between the three of us," Arkin says. Me: "It's a little silly for me to go around the room asking interview questions. Why don't you three guys just talk?" Pacino: "Alan's good at that." That starts them talking about actors who refused to rehearse, and how much they all love to rehearse. "I've never known an actor that wouldn't wanna rehearse," Arkin says. "Even for no pay or anything, just to have the luxury of getting to know the people you're working with if nothing else, playing with the script, finding out ..."
Pacino: "I think that's where you're going." "The minute he spoke, I knew it was him, even though I never met him. And anyway, I had made a musical movie, and he wanted to know the name and if I knew the choreographer. This was 'Pennies From Heaven.' He said he wanted to get in touch with the choreographer. I said, 'I do know him and I'll try to, you know, get him to call you.' And he said, 'I wanna do a musical variety show from my house.' This was funny. Remember in the '90s, people were bringing cameras in their house and stuff like that? He said, 'If I played the piano...you know. And I dance, I studied with Katherine Dunham.' He wanted to do a musical revue from his house and I said that was great. I put him in touch with the choreographer. Nothing happened. That's my Brando story." "I was in L.A.," Arkin says, "when he called me and he invited me to dinner and I went up there and he started doing imitations of me. It was the most surreal evening of my life. He was doing imitations of me from 'The In-Laws.' I couldn't believe it. And one of the things--well, you've worked with him, so you know him better than I--but one of the things that was fascinating about him, you know, he always decried acting. He said, 'Anybody can act.' And he spent four hours, and all he did was act. Constantly acting. He'd tell a story, he'd play all the characters. He never stopped acting." They all thought about that. "I think what's so interesting as a phenomenon of him," says Pacino, "was that no matter what, how he felt about acting or professed to feel about it, in the end, he wound up being this charismatic guy performance artist. Every time you'd see him, whether you'd see him on 'Larry King,' anywhere, he commanded the room and he was acting. He could not get away from his gift. He couldn't get away from it. The gift consumed him. And that was who he was."